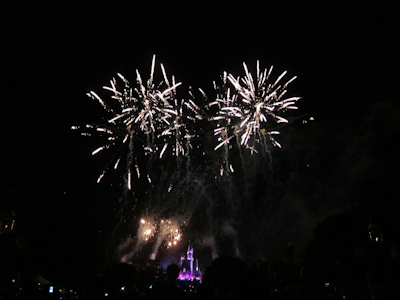 Nobody does fireworks like Disney. Nobody. 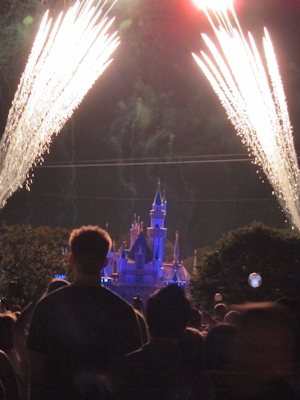 In fact, every time I watch a fireworks show somewhere else I’m left wanting, thinking “can’t you coordinate the music and the fireworks? You can shoot off more than one at the same time before the finale. That’s IT?? ?” for some little civic fireworks show that probably cost a huge amount of money. 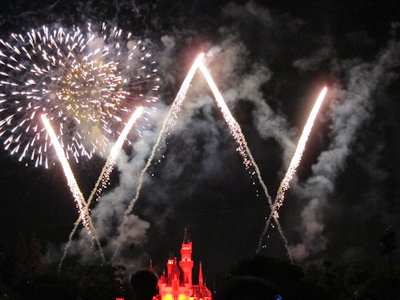 Disney has raised fireworks to an art form, not only with music and timing, but with ground effects and lighting as well. Not to mention the classic Disney soundtracks. 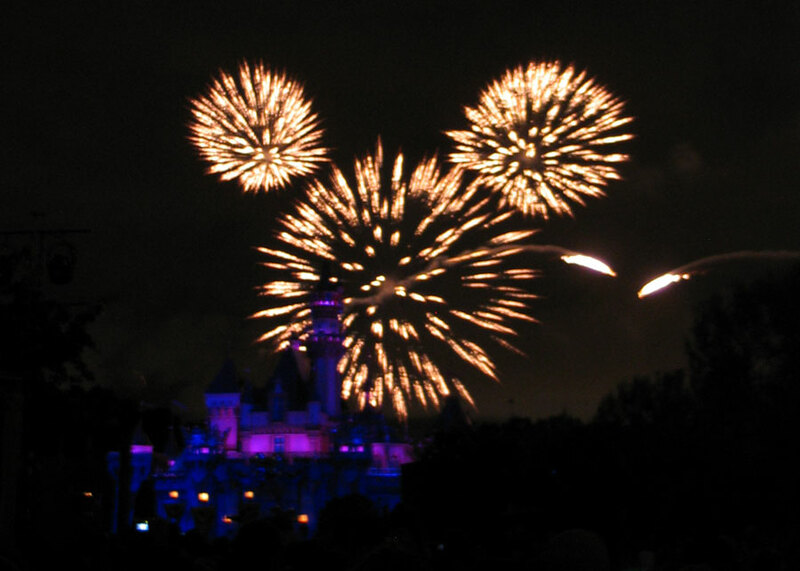 This summer’s fireworks show (it changes, btw) is called “Magical.” How convenient for my search for Disneyland Magic, hunh? Still looking for that–think fireworks may be part of it? I do. Anyway, there are many places to view the fireworks. In the past it didn’t really matter where you were in the park. 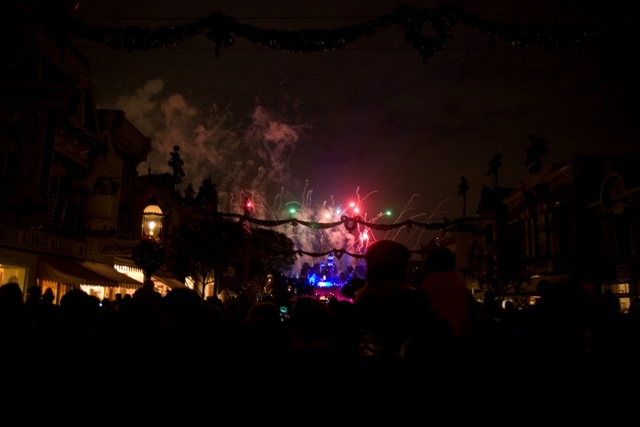 Then on Disneyland’s 50th birthday in 2005, Disney pumped up fireworks to a whole new level. They closed parts of Fantasyland, brought in a lot of lower ground effects centered on the castle, and projected images onto the castle and Matterhorn. 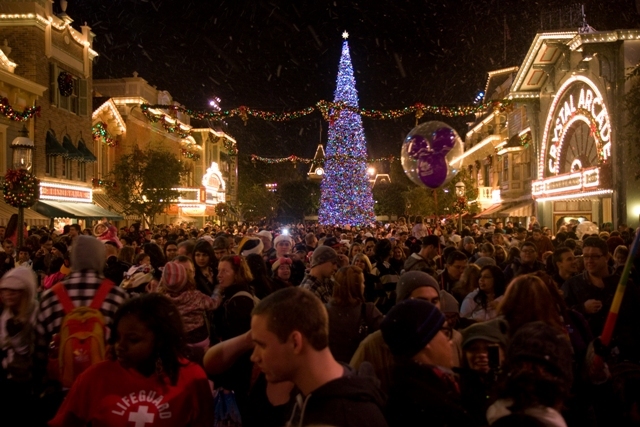 For that show, a spot in the hub (circle at the end of Main Street) was the ideal place to watch. 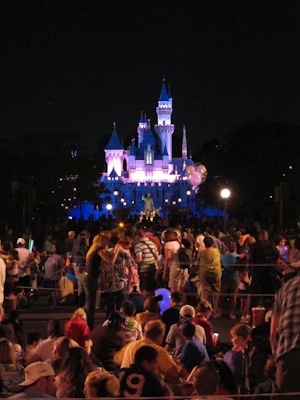 Magical had some castle involvement, basically lights and castle low fireworks, but honestly I think any area in the park where you can get a clear view and hear the music is a good spot. Watching from the Fantasyland side is great, and if you can time yourself to get on a Storybook Canal boat at just the right time, it’s amazing. But that’s tough, since you could end up watching from the line. Still, we usually end up on good old Main Street. 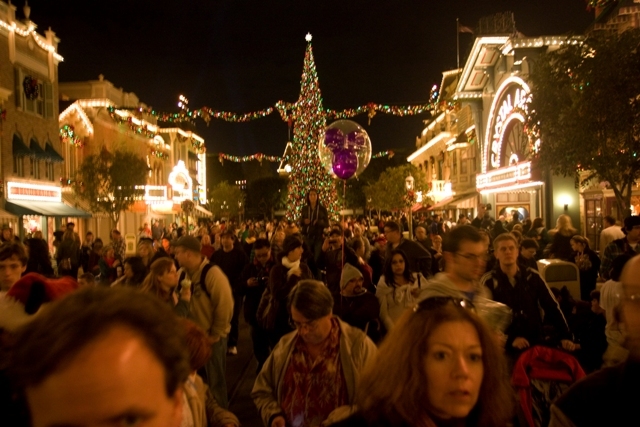 20 minutes before--not too crowded, plus zoom lens! 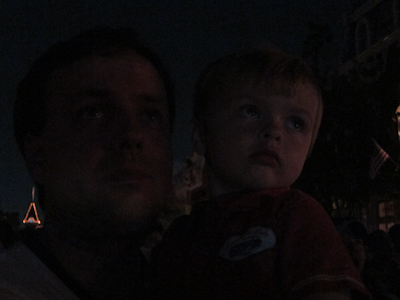 Fireworks viewing can be brutal (it especially was for the 50th birthday show). If you’re a short person like me, it can be very advantageous to stake out a spot 20 minutes beforehand, more if it’s crowded or if you seem to be in a premium location. Many people sit down at first. Theo, where are the fireworks going to be? You’ll notice that there are ropes running across Main Street in a few locations. 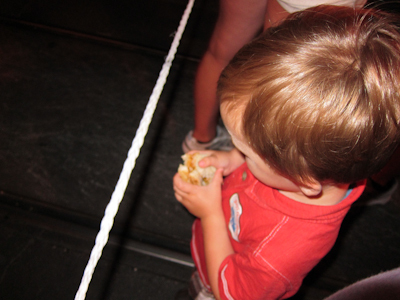 They do rope off some walkways so that in lulls in the show they can shuffle people in various directions. It’s quite organized so pay attention–one route takes you to ALL lands in the rest of the park, the other takes you to ONLY the exit. Anyway, I’ve found as a short person, it’s helpful to be right up against one of those ropes. The gap of people not in front of you really helps. 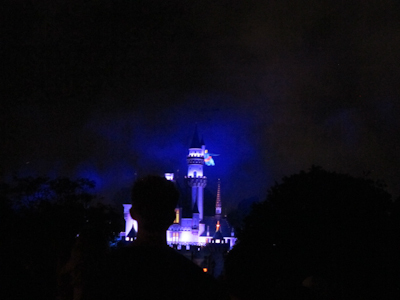 They dim the lights and the castle starts to light up in different colors. 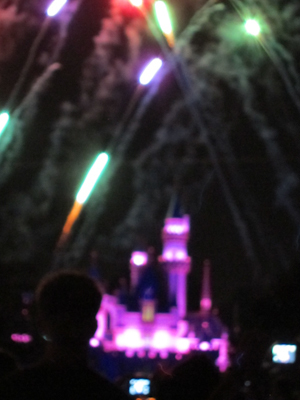 They used to have Tinkerbell start every show, but now they sometimes shoot some fireworks off pre-Tink, like in Magical. 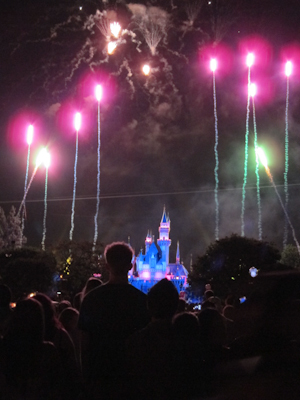 Funny story: when Kevin was a wee lad, he and his mom would stay to watch the fireworks while his dad and dad’s friends went off to “Help Tinkerbell start the fireworks.” Yeah, they’d just go on Space Mountain. Heh. Anyway, Tink does come flying out! Yay! She comes in from the right and goes behind the castle, so I didn't get a picture of her until she was on this side. This part sort of freaked me out a little bit, and not because of my crappy photography. No, Tinkerbell! Don't get shot! 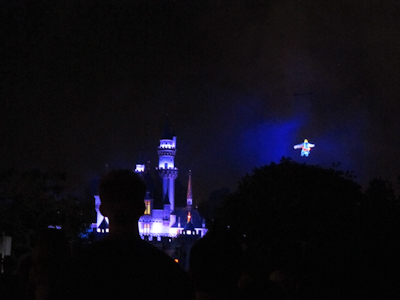 Fortunately, Tink survives, just like she manages to do at every show. Then they do the fireworks, like pretty colored things. 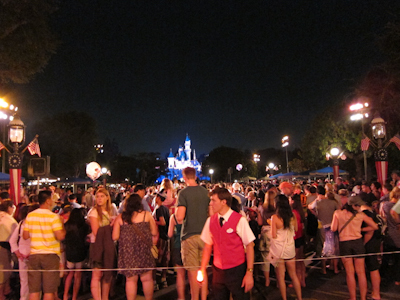 This is an example of a castle effect that doesn’t make as big of an impact if you can’t actually see the castle from either side. Other stuff happens, and apparently they do the up and down color things a couple of times. 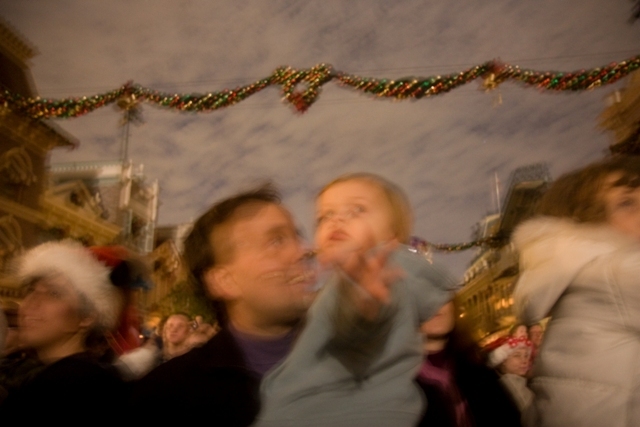 Trying to take pictures and enjoy the show at the same time is very difficult. 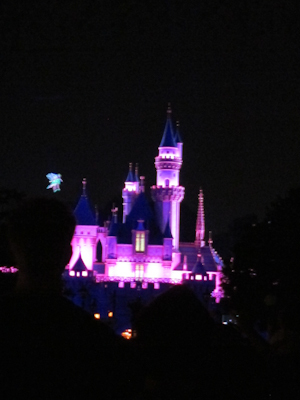 They light up the castle in different colors. This one looks a little…hellish. Despite the look of abject disinterest, Theo actually really liked the show and would burst into applause every now and then. Dumbo whirled around the castle. 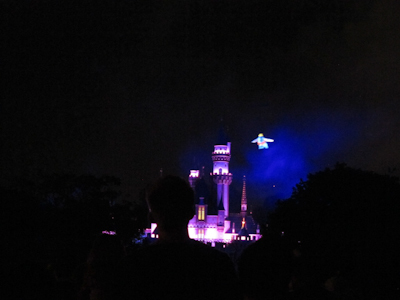 I’ve never seen anything flying other than Tinkerbell so it was a nice surprise. ...elephants fly and so can you! 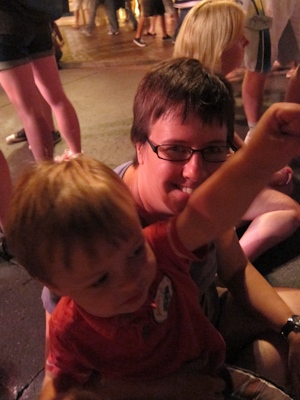 As of yesterday it seems like Dumbo is Theo’s new favorite ride. Which kind of bites a little because the wait is always really long. Dumbo’s flying ears reminds me of the day we got our second beagle, Digory. 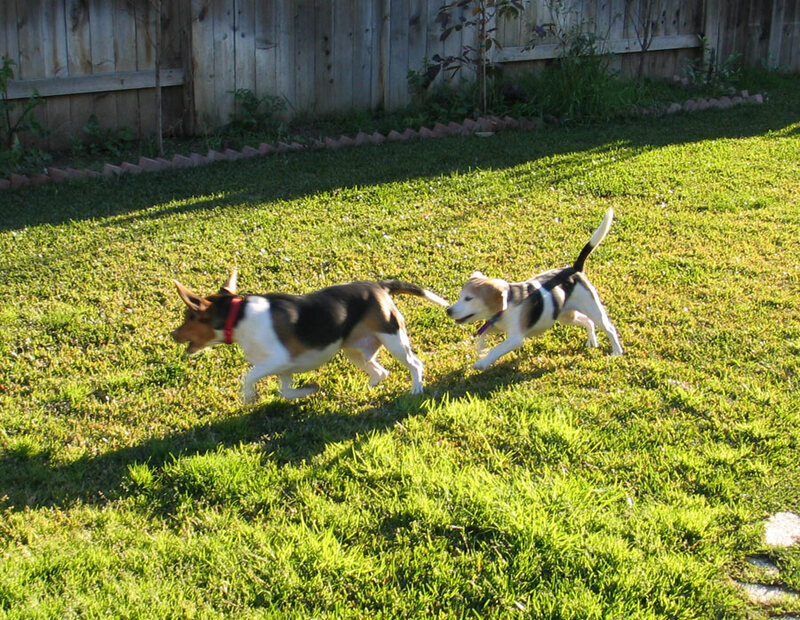 Our first beagle, Scout (RIP *sniff*), was very wary but for one time and ONLY this one time, she actually chased him (from then on out, he always tried to chase her). Anyway, at that point I decided to put the camera down and enjoy the show. That’s one thing about this blog I’ve found is that when you’re documenting something, you really don’t get to enjoy it very much. I always wonder about people who just videotape everything in the park on their vacation. 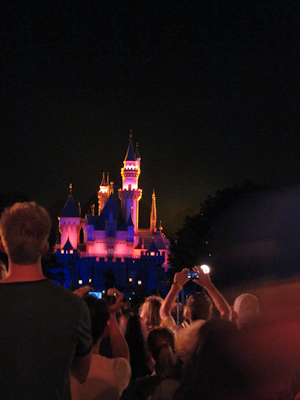 Yeah, the memories are great, but watching everything through a tiny screen instead of in real life just seems so much like you’re missing a big part of that Disneyland Magic. 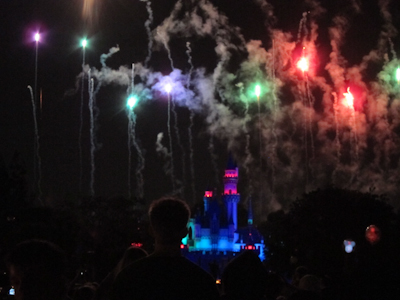 Anyway, Disneyland shoots off some fabulous specials fireworks like heart-shaped ones and even ones that explode in happy faces in multiple colors. 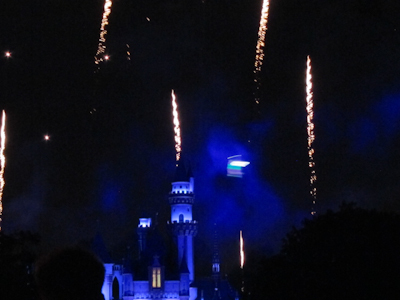 At the end of the show, Cinderella and Sleeping Beauty end up in this fireworks equivalent of a dance-off with one turning the castle and fireworks blue and the other pink. UPDATE–Reader Correction: Apparently I did not spend enough time 1) listening to the soundtrack and 2) re-watching my Disney movies, because a reader corrected that the fight is between the fairies from Sleeping Beauty who are fighting over the colors like in the movie. I haven’t seen the movie since 19something, so there ya go. Hm, what does it say about me that I immediately thought it was like a deathmatch between Cinderella and Aurora? They do manage to work out their differences in the end. And I watched the finale with my own two eyes :). But this is my favorite fireworks picture ever. 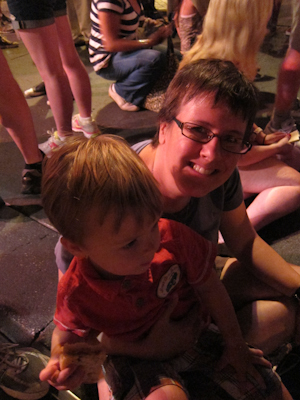 Actually my favorite Mickey picture too! 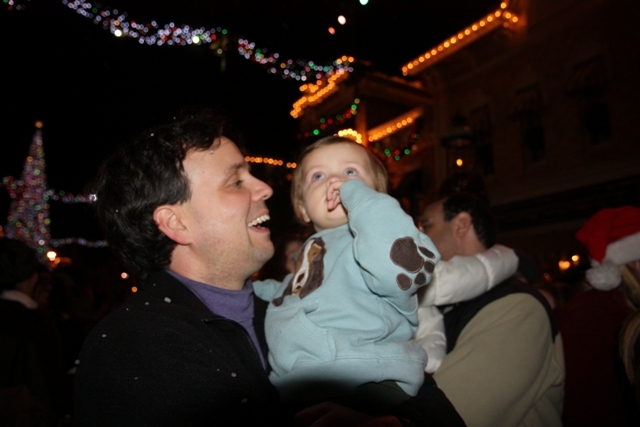 Kevin snapped the following shot on Disneyland’s 50th birthday, May 6, 2005. 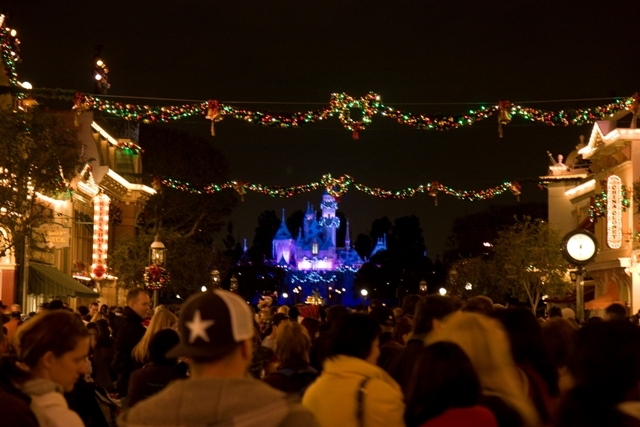 And THAT, my friends, is Disneyland Magic.